3/4" inch solid pinstripe - Professional grade for boats and planes or motorsport vehicles. 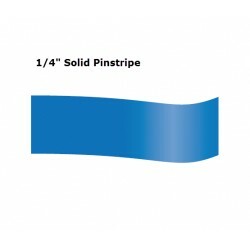 Our TFX vinyl pinstripe is pressure sensitive to allow for easy re-positioning. Available in opaques and metallics. Please note: this picture isn't the actual size of the stripe.